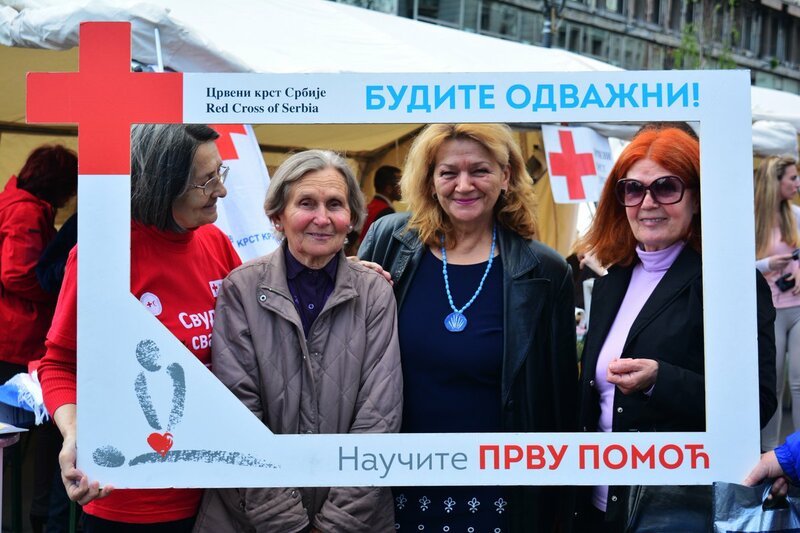 This blog is written by Natasa Todrovic at HelpAge global network member the Red Cross of Serbia. When it comes to quality of life, Albania, Serbia and Montenegro rank in the bottom half of the countries included in HelpAge International’s Global AgeWatch Index. This clearly shows that Western Balkans societies are not ready to face the effects of an ageing population. Six organisations from five countries have, however, joined together to spearhead a response to the growing number of older people in the Balkans. They formed the Taking Action on Social Inclusion of Older People (TASIOP) project. adapt and replicate best practice across the region. We began by improving the capacity of existing civil society networks, and formed new networks in Macedonia and Montenegro focusing on advocacy to improve older people’s quality of life. From there, we expanded to include new members who focus on women or people with disabilities, as well as older people. As we have grown, we are cooperating more and increasing our visibility, helped by developing partnerships with government ministries and working alongside independent human rights bodies. Representatives from each TASIOP country participated in writing national reports on the Madrid International Plan of Action on Ageing and the Regional Implementation Strategy for the Ministerial Conference on Ageing in Lisbon in 2017. For some countries like Albania, Bosnia and Herzegovina, this was the first time civil sector representatives participated in an event at this level. As a result, national institutions, such as government ministries and councils, recognised the significance of the civil society sector’s work creating services for and empowering older people, and advocating for their rights. We are also increasing the visibility of civil society networks across the region, and having a set of new, clear strategic goals has improved the position of the civil sector in relation to policy makers. Understanding ageing in each TASIOP country provided an opportunity to identify gaps and make recommendations on how to fill them. In Serbia, they saw an opportunity for the civil society network to cooperate closely with national independent bodies, such as the Commissioner for Protection of Equality. This lead to official recommendation to ensure older people are granted access to long-term care and palliative care services, which should, by law, be available to everyone without discrimination. TASIOP has funded research in each country to collect data and evidence relevant to the strategic goals of each civil society network and the local contexts, as well as the social inclusion of older people, which is the overarching objective of the project. The research provides an opportunity to collect new information and inform advocacy strategies, activities and recommendations. For example, in Serbia research has revealed a critical lack of accessible healthcare services for older people, which prompted a strong recommendation for policy changes to support accessible care. We welcome grassroots organisations that cannot apply for EU funding work with TASIOP to improve their skills and knowledge. We pilot small, replicable, community-based projects to increase the social inclusion of older people, empowering older people and strengthening intergenerational solidarity. In the last 10 months, there have been 90 applications and 62 projects selected. The Network of Social Researchers from Serbia, for example, connects retired social researchers with those still active, as well as university students, to discuss ageing. This helps connect three generations of researchers and who can share their expertise and discuss current practice and academic theories. One of the students described the experience as “learning parties”, while a retired sociologist wrote a poem about the energising effects these meetings have on older professionals. In future months and years, we would like to transform the image of ageing and older people, and raise public awareness of ageism. We want to do this by working with the media to spread positive messages about ageing and to train older people in citizens’ activism. Watch this space! Find out more about TASIOP and follow Natasa Todrovic on Twitter. TASIOP is financially supported by the European Union, the Austrian Development Agency and the Austrian Red Cross, with the Red Cross of Serbia responsible for coordination. The partners of the project are: Albanian Association of Geriatry and Gerontology, Association Osmijeh (Bosnia and Herzegovina), Red Cross of Macedonia and Association Humanity (Macedonia) and the Red Cross of Montenegro. Association Slovene Philanthropy (Slovenia) is also a partner due to Slovenia being an EU member and having a history of taking action in response to demographic ageing.